This summer, Sen. Barack Obama (D-IL) will become the first minority to become the presidential nominee of a major American political party. And that has raised some questions about American society: Are we now truly color blind, or do we still need affirmative action? Thirty years ago today, the U.S. Supreme Court ruled in the case of the University of California Regents v. Bakke. Allan Bakke, who is white, sued the medical school at the University of California at Davis, saying he said he was denied admission in favor of a less-qualified minority candidate. 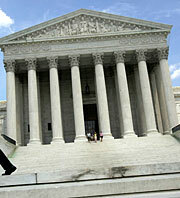 The Supreme Court ruled that public institutions can't use quotas to set aside spots for minorities. But from there, it gets more complicated. Here to help us sort out some of the legacy of the case is Cathy Horn, assistant professor of education at the University of Houston. Desiree Cooper: Cathy, it's 30 years since the ruling of University of California v. Bakke. What was the gist of that case? Cathy Horn: The Bakke case challenged the way that race can be considered in college admissions decisions. And what it said was that while you can't use quotas -- meaning you can set aside a specific number of slots for students of color -- you can consider race as a "plus factor," an additional consideration as you are reviewing a student holistically for admission into college. Cooper: Now, I remember with the Bakke decision, in the civil rights community there were a lot of wailing and gnashing of teeth that in some ways it was perceived as a loss. Because you know, it seemed like a slide away from being actually able to say "We value having African-Americans or Hispanics in our school" and we had to kind of go behind a back door. We couldn't have quotas, we could talk about race -- you wanted to talk about diversity. In the 30 years since Bakke, the court has really stood by this idea that diversity is a core value of higher education. So how are we doing now with diversity in higher education? Horn: It's interesting that you point out some of the frustration of the civil rights community raised following the Bakke decision. Part of that came out of this shift in legal language away from trying to remedy current effects of past discriminations, so really trying to keep an eye on the way that policy that practice had been discriminatory in nature, to one that was much more in line with "we see benefit in diversity and let's use that as our lens for understanding campus policy and practice." The Civil Rights Movement of the '60s had a tremendous effect on increasing access for students of color -- and you see that in the 1970s all way through the '80s. And unfortunately, what we've seen even in the context of being able to continue to use race as a consideration where it hasn't been banned in other ways -- for example, as it is in California -- that even in that context, we've really seen a retraction of access for students of color. What are the alternatives to affirmative action that colleges and universities are using now? An additional approach to considering application has been these been automatic admissions polices. The original policy was in Texas and that's what we know as the "10-percent plan." That gives access to any student graduating in the top 10 percent of his or her class an opportunity to attend the college of his or her choice. It only works for certain if you know that some schools are predominately black, predominately Hispanic -- then the top 10 percent of those schools are going to be minority kids. So it's kind of like the 10-percent rule is building in an assumption that segregation continues to exist in K-12 education. That's exactly right. The 10-percent plan benefits from a broken elementary and secondary system in the state. You know, it's really unfortunate when we have to try and think about in the context in what Texas often talks about is this "seamless educational pipeline" from kindergarten to college graduation -- that we take one part that's damaged, if you will, and we try to benefit from that damage to create a better opportunity on the other end. It really is almost a perverse logic. I think we need to think about what we're doing once they're in to help them through successfully. We as a higher education community think a lot about diversity on the front end. I would challenge that what we need to do better is think about diversity systematically throughout the process through a goal of outcomes. Cathy, thank you for joining us.